Pet Food - OMIC USA Inc.
We offer a range of pet food analyses, from premium vitamin and mineral testing that may be necessary to substantiate nutritional claims to the basic proximate analysis needed to meet labeling requirements and for generating guaranteed analysis panels. 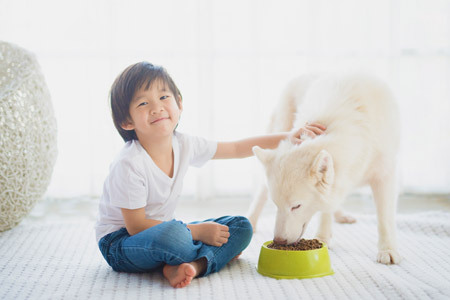 When it comes to pets, we understand the importance of a nutritious and balanced diet. Let us help you verify and label your pet food, giving your clients the peace of mind they expect from quality products. Custom analysis available upon request. According to the AAFCO model regulations, all pet food products should have a section of the label titled “Guaranteed Analysis.” Important to note is that a single analysis of a product may not provide sufficient data to determine reliable guarantees. Because it is unlikely that the exact same value for each nutrient will be obtained when different batches of the same formulation (recipe) of the product are analyzed, it is helpful to know what the typical variation is for each of the guaranteed nutrients. AAFCO recommends determining the variation by analyzing at least three—and preferably more—batches of the product to determine the variability for each nutrient being guaranteed. If variability is large, consider testing more batches to assess the extent of the variability and to set guaranteed values with respect to the allowed analytical variances in the Official AAFCO Publication.